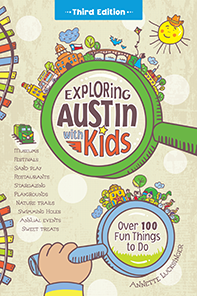 Exploring Austin with Kids News - Meet the Toymakers! Note: Upon the retirement of owners Paul and Georgean Kyle, Rootin' Ridge Toymakers closed its doors in December 2015. It will be missed! If Fred Rogers were still alive, exploring his neighborhood, Rootin’ Ridge Toymakers is exactly the type of place he would take his viewers. The owners hand craft many of their wooden toys, which gives their small shop a unique sense of charm and timelessness. Recently, on a fine winter day, I put on my sweater and sneakers to go visit my neighbor, Georgean Kyle, who owns this little shop in central Austin with her husband Paul. If you have never been, it’s what you might picture Santa’s workshop to look like. Freshly made toys rest on rows of shelves and fill colorful bins. Wooden trains, puzzles, blocks, doll and tree houses, musical instruments, cars, and rolling toys sit invitingly at the height of toddlers and preschoolers, their chief customers. “We love to have kids come in and play!” Georgean said. Even better, a workshop sits behind a glass viewing window where customers can watch toys being made. Shorter visitors can can climb a small platform to get a better look. “We have finger and nose prints on the glass all the time,” Georgean noted. Both she and Paul make the toys. Paul does the straight edges and Georgean, the curves. Throughout the process of sanding, drilling, routing, re-sanding and assembling, the toys go back and forth between them until finished. There is little plastic in this shop, and the only sounds the toys make are kid-generated. There is a clear philosophy behind the toys they sell. As Georgean described it, “Children don’t need to have toys that go ‘Bonk’ and ‘Beep.’ The child should be the power behind them, rather than them just sitting and watching.” Toys should be powered by imagination. She admits that she and Paul have been around long enough to watch the popularity of wooden toys wax and wane, but one of the more rewarding parts of her job is seeing children who visited her shop return as adults with their own children.